Alan Feldman served as the soccer club’s president for more than a decade and helped change the way youth soccer was run in the township. In his 18 years as a volunteer with Cherry Hill FC, long-time resident Alan Feldman wasn’t concerned about wins and losses. He was more focused on making sure the hundreds of kids who took the field were having the time of their lives. After many years of being actively involved with Cherry Hill FC, Feldman’s time as a volunteer came to an end earlier this year when he stepped down as president of the club. 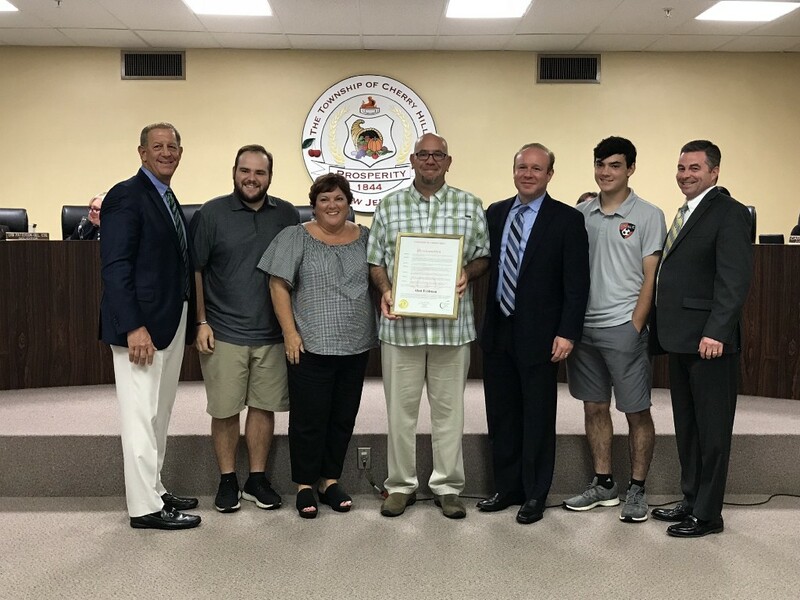 Feldman’s volunteer efforts were recently recognized when he was presented with a proclamation at Cherry Hill Township Council’s meeting on Tuesday, Oct. 9. The father of two boys who grew up playing soccer in Cherry Hill, Feldman also grew up in the township playing soccer. A 1980 graduate of Cherry Hill High School East, Alan and his wife, Fran decided to raise their kids in Cherry Hill. In 2000, just as Feldman’s oldest son, Tyler was getting his feet wet in soccer, Alan decided to sign him up for the rec program at Cherry Hill United, the predecessor of Cherry Hill FC. When Alan saw how the players were being coached, he decided to get involved. Alan became the coordinator of the rec division for Cherry Hill United, kickstarting nearly two decades of service to the club. The number of positions Alan has held with the club is long. He’s done everything from recreation director and director of fields and facilities to serving as the club’s president from 2006 to 2018. Alan’s tenure as president began just as major changes were taking place with youth soccer in Cherry Hill. Alan and a couple other board members from Cherry Hill United met with members of the Cherry Hill Girls Soccer Association to resolve their issues. This resulted in the merger of the two organizations. The two groups formed a new club, Cherry Hill FC, with Alan serving as president. As president, Alan wanted to make sure the club was focused on serving the entire soccer community, from the youngest rec players to the club’s top travel teams. Alan described his time at Cherry Hill FC as having a second job. He spent countless hours at the club’s fields and was involved in more jobs than he can remember. One of Alan’s favorite jobs with Cherry Hill FC took place before many of the players, parents and coaches showed up at the facilities on the weekend. Alan is proud to have overseen the growth of Cherry Hill FC. At its peak early this decade, the club had up to 40 travel teams and 65 rec teams. Alan opted to step down earlier this year with both of his sons being older. Tyler graduated from Cherry Hill East in 2012 and Nick, currently the starting goalkeeper for Cherry Hill East, is in his senior year. Former treasurer Stephen Perez took over as president in June and Alan has worked with him on the transition. Looking back on his time as a volunteer, Alan doesn’t believe he could have done it without the support of his family. His wife, Fran, served as Cherry Hill FC’s treasurer for about a decade and Alan credited her being a big reason to why he was able to volunteer for such a long time. “Thankfully, for me, she was always there,” he said.